Want to learn how to add user ratings to your WordPress forms so people can tell you exactly what they think? Gathering customer ratings and reviews about your business, brand, and their own experiences is a great way to strengthen customer relations and boost overall sales and conversions. In this article, we’ll show you how to add user ratings to your WordPress forms. When it comes to finding out how your customers feel about you and your brand, star ratings on your forms make it easy for site visitors to express their thoughts. It also gives you a quick and easy way to address any concerns site visitors may be having. 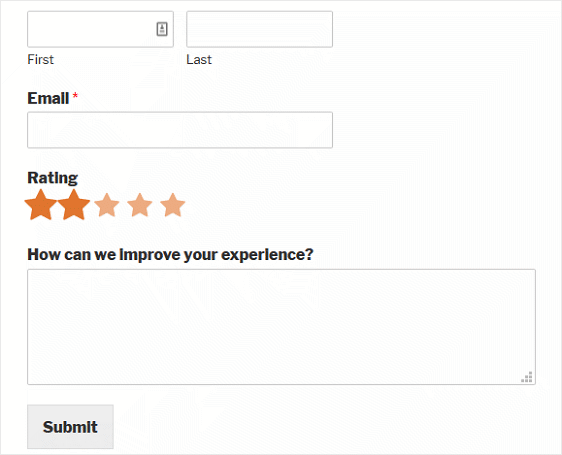 Rating fields on your WordPress forms also give you the chance to easily gather reviews about your business that you can add to other parts of your website, such as your testimonial section. And, since 72% of people say that positive reviews make them trust a brand more, it’s important to make your business’ good reviews available for people to see when they visit your site. Now, let’s see how you can add a rating system to your WordPress forms. Next, you’ll need to create a new WordPress form. 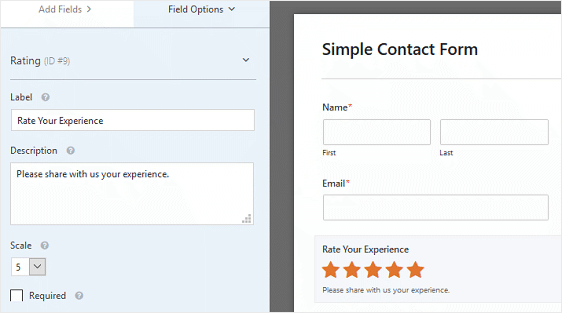 For detailed steps, see our tutorial on creating a simple form in WPForms. Once your form is created, you’ll need to add a rating field. To do this, go to the form editor and drag & drop the Rating field from the left hand panel to your form on the right side. Once the rating field is added to your form, click on it to open the Field Options panel so you can edit it. Under the Label section, label your rating field. Underneath this section, you can give your form field a description. This lets site visitors know what you are asking them to rate. If you want to change the number of icons your visitors can choose from, do this using the Scale option. You can choose between 2 and 10 icons. By default, the rating field displays star icons. To change your icons, click on Advanced Options and choose the icon of your choice from the Icon dropdown. By default, your icons will be set to size Medium. To change this, choose Small, Medium, or Large from the dropdown menu. Lasltly, your rating icons will be always be orange. But you can change that using the color picker tool. 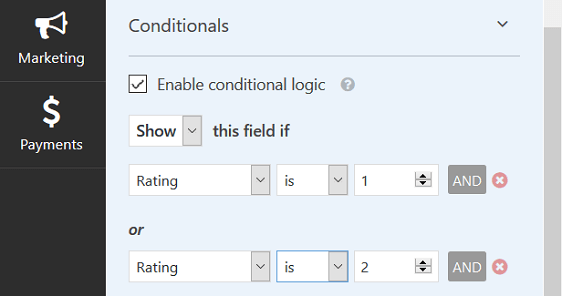 If you want to take things one step further, you can enable conditional logic for your rating field that will show or hide certain fields on your form depending on a user’s rating. In this example, we’ll show you how to ask a user for more information if they share a 1 or 2 star rating. To start, add a Paragraph Text field to your form. Next, change the label of this new form field to something like “How can we improve your experience?” so users can express their thoughts. Now, set up conditional logic so that anytime someone rates their experience as a 1 or 2 star rating, the Paragraph Text form field will appear for them to fill out. Click on the Conditionals section and check the box labeled Enable Conditional Logic. You can now set the rules to determine when the field will show. For the first rule, we’ll set the logic to read: Show this field if Rating is 1. Then click on Add new group to set the second rule to read: Show this field if Rating is 2. Now the Paragraph Text form field will remain hidden unless a user selects 1 or 2 stars while filling out your form. The last thing you need to do is add your form to your website for users to see. For help with this step, check out our tutorial on how to display forms on your website. And that’s it! You now know how to add user ratings to your WordPress forms so you can gather feedback about your site visitors’ experiences. For more ways to use smart conditional logic to get site visitor insight into how you are doing as a business, check out our article on creating clutter-free forms with smart logic. Also, if you are looking for more ways to improve sales, check out this beginner’s guide to email marketing. I apologize as we don’t have a way to add additional ratings icons right now. In case it helps, though, you could consider setting up something similar by using image choices in a Multiple Choice (radio button) field. If you’d like to see an example, here’s out tutorial on setting up image choices. Hopefully that’s a helpful alternative! If you have any additional questions about this, please get in touch and we’d be happy to assist further. You can display the results of a poll in your website. The poll results can be added to your form’s confirmation message or you can also use a shortcode to display the results anywhere on your site where a shortcode is allowed. With that option, it’s even possible to customize display options such as whether the number of votes is displayed. For detailed information on how to do this please check out our guide.